Our nails tend to say a lot about us, especially when we are meeting someone for the first time. Are you off to your next big meeting, job interview, or you are going out on your first date? All of these situations will require a neat manicure, because who wants to look sloppy? You should clip, file and paint your nails in order to leave a good first impression. And we know that filing your nails can be so hard sometimes because it seems like every move you make somehow ends up being the wrong one. 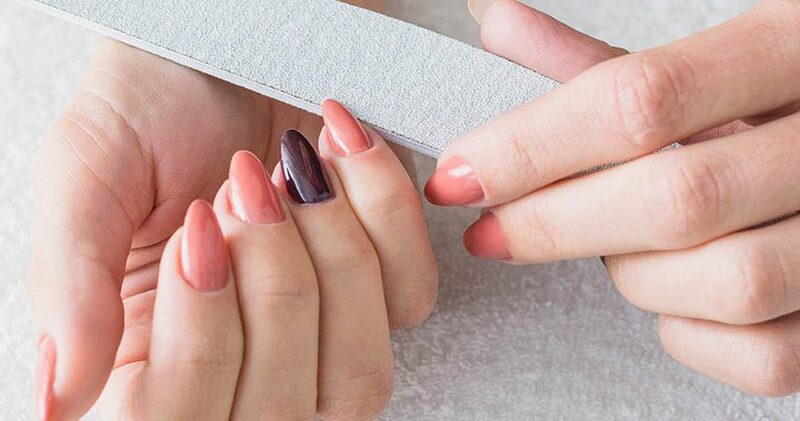 Well, if you want to prevent any further chips, and you want to ”nail” it this time, just keep on reading to find out how to file your nails like a pro! What Do I Need to File My Nails Properly? Although the process seems quite easy it is also important to have all the right tools. Many celebrity nail artists recommend using a 240 grit nail file. Women with weak and brittle nails can use a file by a brand Diamancel which won’t break your nails. Also, you can try out glass nail files, these are ideal for everyone but are also often expensive. 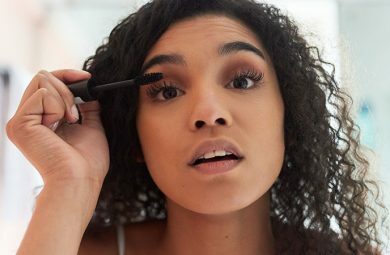 Let’s first off start with what you shouldn’t do, and that is filing your nails back and forth. Instead, file your nails on the side and drag the file to the center in one direction. Make sure you hold your file lightly between your thumb and index finger, don’t grasp it. Lift up the file from the nail once you get to the end and return to the starting point, and don’t drag it downwards. Also, make sure your motions are confident and fluid. Do one fluid motion from side to the center. This is a lot less painful for your nail bed, and it is not as aggressive as a few insecure attempts. File your nails in a such a way that you are either left with a square, almond, or oval shape (we will get to these later down below). Don’t move your file back and forth since wiggling it too much can be harmful. Once you get your desired nail shape don’t forget to clean underneath your nail. Place your file under it and use flicking motions to create a smooth surface. This way you will get rid of any unwanted residue. If you want a particular nail shape such as almond, square or oval, keep on reading to discover how to file your nails a certain shape. Mark the middle point of your nail with your file and start filing from one side at a 50° angle. File in one direction only until you get that sharp edge. Redo the same thing on the other side. Focus on the center and file it until you are left with that U-shape. Start with filing the edges and get them as sharp as possible. File in one direction only and under the nail until you are left with a straight nail. Make sure that the edges are not too rough and file them lightly. Oval nails are a lot like your natural nails, which means that they are super easy to achieve. File them towards the center of your free edge. Make sure you are working at a 45-degree angle when filing both sides. File the center and make round and smooth motions. 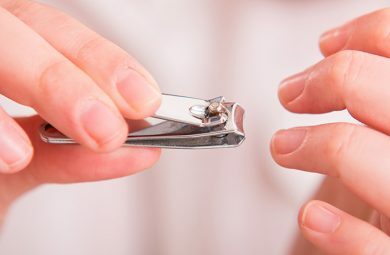 Only file your nails after you’ve cut them with nail clippers. Also, keep in mind that shorter surface is a lot easier to work with. Always clean your hands and nails after you are done with filing them. This way no germs or bacteria will get stuck underneath. Use hand lotion or cream to restore moisture. You should use something aloe vera based, or filled with almonds, shea butter, or coconuts. Use cuticle oils since these can strengthen your nails and will help out with pushing back your cuticles. However, don’t trim your cuticles no matter how red or chipped they may be. Never share your nail file with someone else since it is not sanitary. 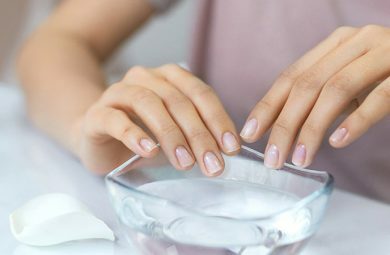 Clean your nail files to prevent any infections by placing them in warm soapy water. Glass or ceramic files need to be scrubbed with a brush. Rub the dirt from both surfaces with a nail brush. Throw away cardboard nail files after you’ve used them for 5-6 times. Soaking them with water ruins them, so it is better to repurchase new ones.